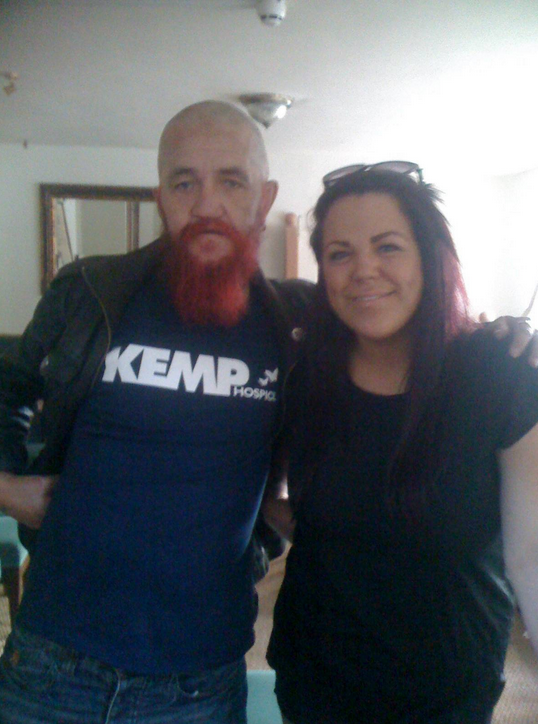 Richie “wacko” Watkiss from Bewdley has dyed his very long beard red to raise money for KEMP Hospice’s KEMP for Kids appeal before then waxing it all off on the anniversary of his daughter’s death in December. Sadly Richie lost his beautiful 25 year old daughter, Nicola Louise Watkiss, to an asthma attack on 20th December in 2008. Since then he has been a continued supporter of KEMP Hospice by taking part in a whole host of fundraising events such as a 24-hour darts and 24-hour pool marathon. Richie has a great network of support from local businesses in Bewdley and around Kidderminster, and to date has raised in excess of £2,000.00 for KEMP Hospice. If you would like to help Richie raise funds for KEMP in his dying and waxing challenge, please visit the following local businesses to make a donation: The Wribbenhall Social Club. In Bewdley the Talbot, Weatherspoons, HR’s, Merchant Fish Bar, the Wagon & Horses, The Great Weston, and The Angel. In Kidderminster the Boars Head, Bijou Hair & Beauty and the Red Man.